After a seemingly eternity of baking cookies, I was really ready to get into bread. For one – it’s a lot less work! (more waiting time) And I knew it would be a real challenge for me. I don’t eat or make much bread, so I was excited to practice my skills. 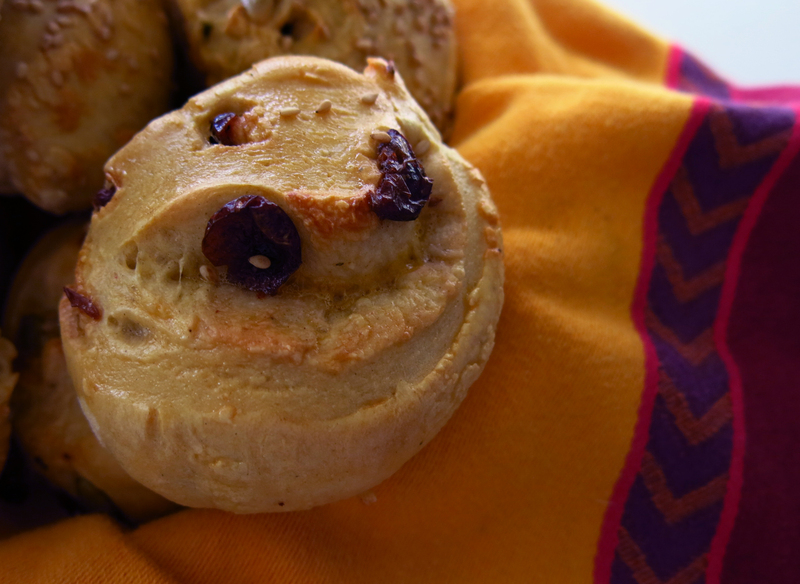 The first challenge of the episode was to make rolls with rye flour. I already knew I was in trouble. First, I rarely eat rolls (more of a fresh hot slice gal) and I very rarely eat rye bread! I picked the brain of a friend who went to pastry school and makes bread and she was very helpful in guiding me along the process (“the dough was so tough!” “Yeah, it’s rye – there’s less gluten so you need to work it more to develop it!”). Did you know that there was ‘light’ rye and ‘dark’ rye? (Is pumpernickel considered dark rye? Or is it colored with something else?) I had no idea. I went with light rye. 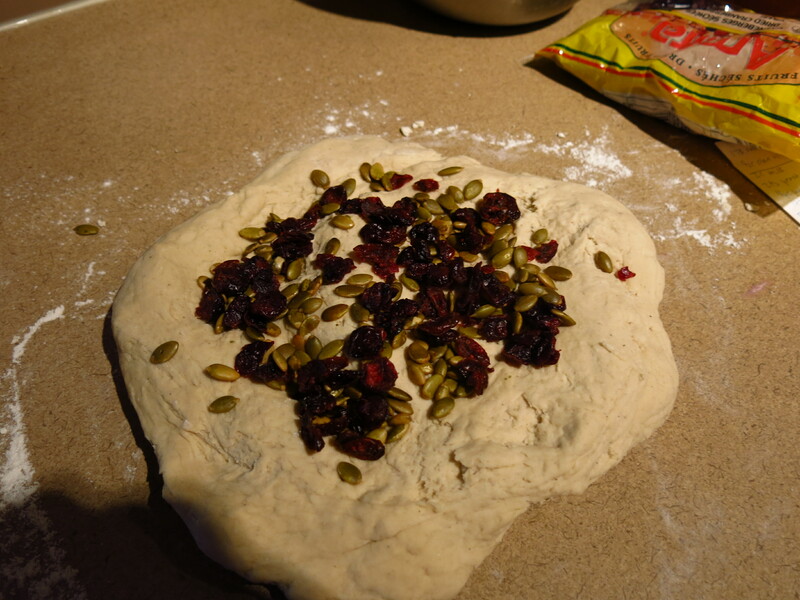 I opted to not use walnuts and made a plain dough and added in roasted pumpkin seeds and dried cranberries. I mixed the water, sugar and yeast and let it sit. But nothing really happened… I discovered later on that I should have used hotter water. Dried active yeast has this protective layer that has to be “melted” off for the bacteria to reactivate! Not too hot of course, and they need the sugar to power up. So that was already mistake #1 (not letting the yeast bloom properly). I mixed the dough together and started kneading. And kneading. And kneaded some more. It said to knead it until “smooth and elastic” but this dough was so dense and hard to knead, it was difficult to figure out when to stop! I had been warned it was going to need some extra TLC…but how much? 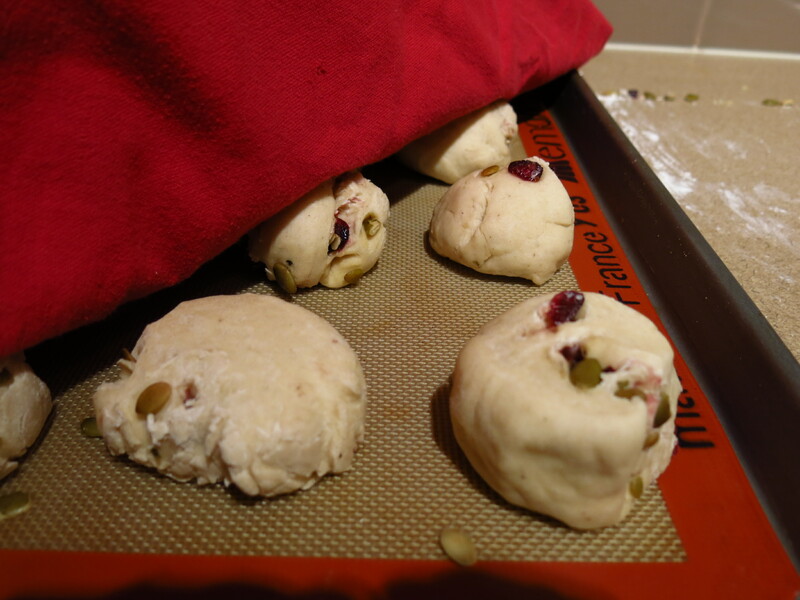 Anyway, I then attempted to fold in the seeds & cranberries and let me tell you – that was a challenge. Seeds & cranberries were flying everywhere! 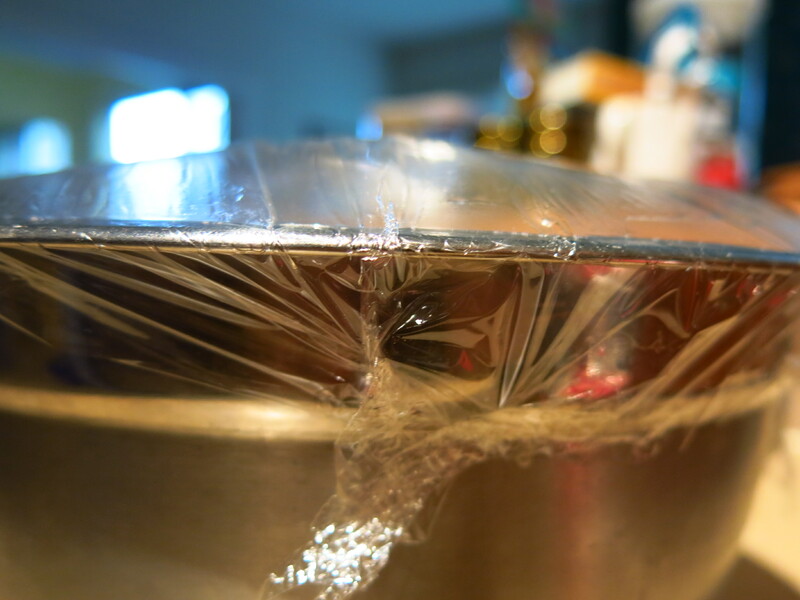 And the tough dough was not making it any easier….Eventually I let my dough sit and proof. 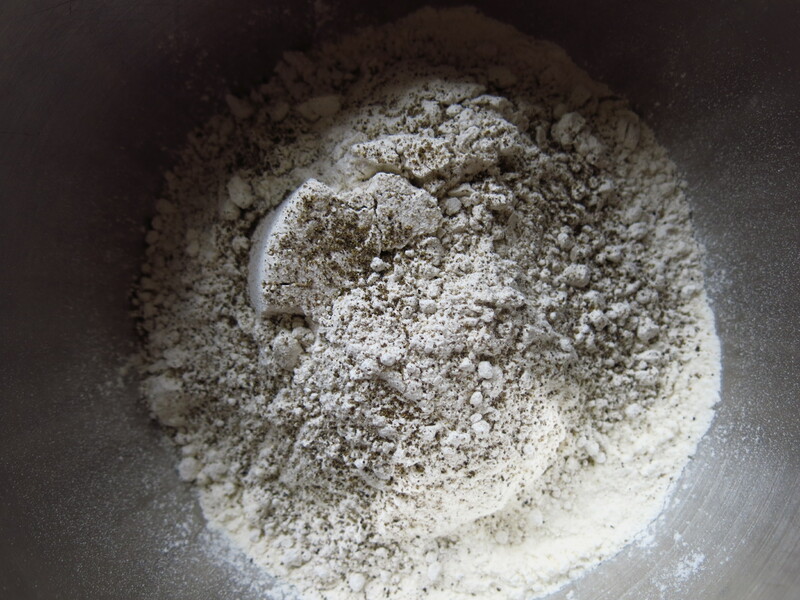 I thought this view of the dry ingredients before mixing was neat. Very moody, haha. It reminded me of the experiments we used to do in Science class in high school when we’d toss rocks into sheets of flour & cocoa powder to measure the direction & velocity of “asteroids” hitting the surface. Now shaping the dough was tough. Literally. I think if I had proofed the yeast properly, I might have yielded a softer dough. When I had a knob of dough to roll into a ball, it barely budged shape. 😦 As a result, I had about two dozen slightly misshapen rolls ready for a second rise. And off to the ovens! One key thing, perhaps mistake #2 was that I did not set up a steam bath, which was not in the recipe instructions, BUT demonstrated on tv! I think this would have helped make the rolls a little more fluffy. 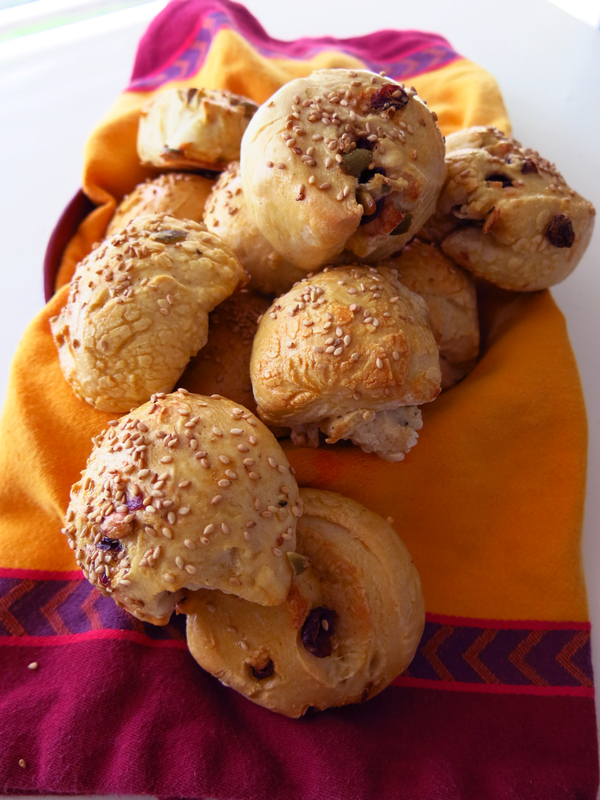 So here are the results – some very pretty but rock hard rye rolls. Ugh. I was tempted to scratch this attempt and try it again…but I remembered that the spirit of the challenge was to TRY these recipes. I did not expect myself to master an area or a technique. Failures happen. Maybe when I’m done the whole thing I will circle back and reattempt a few recipes once I’ve picked up a few more pointers. Next up – Technical Challenge: Ciabatta!